Using knowledge he had acquired at Loomis and as a lifelong golf fanatic, Dvorak saved architectural fees by designing the course himself. He was also the project manager, hiring shapers and irrigation experts as needed and even building one hole, the short Par 4 15th, by himself while his crew’s backs were turned. Indeed, the 315-yard Par 4 is one of Shuksan’s most compelling holes. Quirky and strategic, it’s only after three or four tries the golfer knuckles down his preferred route to the green. Does he take the sensible option and bunt a 4-iron to a safe position in the fairway leaving himself a wedge or 9-iron to the green, or does he risk a driver which he can either loop over the trees on the right or fade around them? The bold shot does not come without risk, of course. Slice it right into the forest and there’s next to no chance you’ll ever see the ball again. Fail to impart the required fade though and you’ll run out of fairway and plunge down a steep bank into the undergrowth where it will surely suffer the same fete as the one that went too far right. Hit your Sunday best, however, and you could scramble up onto the large, flat green and get a look at eagle. The 4-iron tee shot finds a level stance on the fairway and leaves a simple enough pitch shot up the hill that fronts the green. But you won’t see the bottom of the pin, so judging how hard you need to hit the shot won’t be easy. The 15th is typical of Shuksan; attractive, entertaining and as easy or difficult as you want to make it. The course is named after one of the North Cascade’s highest peaks but it’s actually Shuksan’s taller, snowier neighbor Mt Baker (10,781ft) that forms the impressive backdrop for the 5th and 11th holes. It is a wonderfully natural layout with plenty of wildlife and native vegetation though it benefitted recently from a tree-felling program that saw dozens of firs come down around the 5th, 6th, 11th, 13th and 17th holes. As well as enhancing the views, sunlight is getting through to the greens for the first time in years. The payback should be evident this coming summer when Shuksan’s greens might once again be considered among the best in the region. Here’s yet another potentially card-wrecking Par 5. It extends only 541 yards from the Blue tees but plays an awful lot longer thanks to steeply rising terrain over the last 75-100 yards. Mercifully, the drive is relatively straightforward. A small pond to the left of the fairway at about the 265-yard mark is really the only hazard to consider, so you can tee it high and let it fly without too much fear of finding trouble. The second shot is much the same. Only the very strongest of players could ever hope to drop an approach onto the elevated putting surface so it’s really just a case of chasing a 3-wood or hybrid as far up the fairway as you can. That said, you don’t really want to be halfway up the bank as the grass can be long and you may see only the very top of the flag. Better to hang back about 90-100 yards where your lie will be flatter and you get a better view of the pin. The green is rather an odd shape – 35 yards wide yet only ten or so deep – and tilted sharply from back to front. That makes controlling the distance of your pitch shot all the more important, not to say, extremely difficult. If the pin is at the front, you will likely face a quick downhill putt from the back of the green. If it’s at the back and your pitch goes long, you face one of those nightmarish chips where you can’t possibly hit the ball soft enough to prevent it from racing past the hole. Though all the golf course a typical 18-handicapper could ever want, Shuksan does throw up half a dozen decent birdie opportunities. The opening hole, from its elevated tee, should only require a drive and a wedge, while the Par 3 2nd is only 161 yards from the back tee and possesses a large, round, flat green. The 5th is a short Par 4 that long hitters should devour and though the Par 5 7th features a green tilted sharply from right to left, two good strikes should get you close enough to the putting surface for the pitch shot to be relatively simple. On the back nine, the Par 5 13th can be reached in two with a couple of really stout blows and the sensible golfer should avoid the trouble on the inward half’s other Par 5, the 18th, without too much difficulty. The demands of the superb Par 4 15th are documented above. It’s one of those great holes where a potential three can turn into a six very quickly. The 7th is 582 yards from the back tee but drops some 50ft to the fairway making it play quite a bit shorter while the 540-yard 13th can be reached although the pond in front of the green is daring you not to hit it thin and come up short. The Par 4 driven most frequently at Shuksan is the 15th, one of the quirkiest and most enjoyable holes you’ll see. Trees are an ever-present problem down the right side; the large, flat, plateau green sits 15-20ft above the level of the fairway; and the hole bends very gently from left to right meaning you can run out of fairway and find yourself in some pretty deep mess if your tee ball doesn’t fade slightly or carry the trees on the right. Unless you really do hit a long ball or arrive on the tee brimming with confidence, taking the driver may therefore be the asking for trouble. You have to love a course that sends you off with as elevated a tee shot as that at the 1st. For your ball not to get at least some air time and travel an awful lot further than it should have, you have to hit an absolutely atrocious shot. 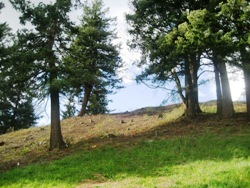 Try not to get snagged in the trees on the left and be wary of going too far right as you may end up behind one of the mounds between the 1st and 9th fairways. But don’t be shy, give it a lash. NB Saying the tee shot at the 1st is the most fun shot you’ll hit all day does rather suggest the excitement is over early. That’s certainly not the case at Shuksan, however. The pitch up the hill to the green at the 4th is full of drama and the shot down the hill to the 5th green is especially entertaining with Mt Baker rising in the background. The downhill tee shot at the 10th, like that at the 1st, inspires a full-blooded swipe, and the short 11th is a beautiful hole with the mountain looking on. The approach over water to the 13th requires nerve, and then there’s that tee shot at the 15th. The 3rd is a 395-yard Par 4 whose length indicates you should make more birdies than you do bogeys. It’s a 240-250 yard drive followed by a smooth 7-iron for most golfers. If only it were that simple though. To stand on this tee box is to feel doubt. Out of bounds lurks all the way down the left side and a pond lies in wait to the right. The fairway is wide enough that, were it bordered by short treeless rough, you’d probably hit it every time. But it isn’t. And the fear of losing your tee shot suggests a hybrid might be prudent. No good golf hole allows you to tee your ball up high and bludgeon it without at least some consideration as to what might happen should you lose control of it. 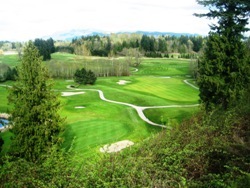 Shuksan has a number of holes where you are strongly urged to take your driver and give it a fair larrup – 1st, 4th, 7th, 12th, 13th, 16th, 17th, 18th (be careful not to go too far at the last or you'll reach the creek) – but there’s always trouble waiting for the reckless who do so without due care and attention. Shuksan is, without question, one of the most enjoyable layouts in Washington. 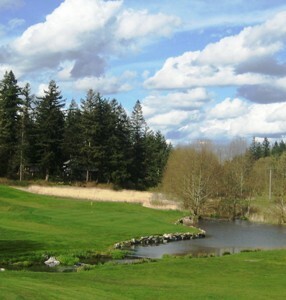 It certainly isn’t the sternest test, even in Whatcom County, but one round is usually all it takes to grow a very soft spot for this beautiful course. Slope: 121 (Blue), 115 (White), 123 (red). 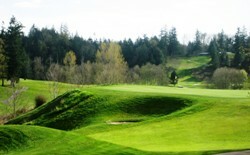 Green Fees: $25 weekdays, $32 weekends.